How about discussing Huqooq ul Ibad (human rights) in this blessed month? How about saying that there is no greater right of the living than the right to life? And there is no greater sin than the taking of an innocent life which is happening with regularity in indiscriminate bomb attacks almost everyday in public places? As to the convoluted justifications for killing of the "infidels", it is important to remember that the Holy Quran describes Prophet Muhammad (PBUH) as Rehmat-ul-lil-Alamin, not just Rehamt-ul-lil-Muslimeen. The Prophet of Allah was sent to this world as a blessing for all, not just for Muslims, a fact often forgotten by bigots and terrorists who claim to be Muslims and carry out unimaginable atrocities in the name of Islam. 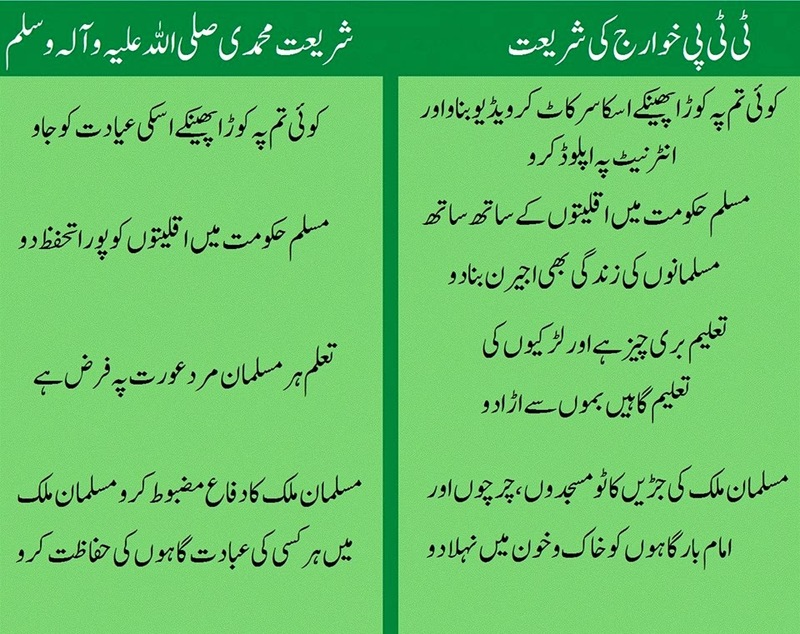 TTP's "Shariah" is Distortion of Real Shariah. Just Say No to it! It seems to me that there is an urgent need to bring Huqooq ul Allah (Duties to God) in better balance with Huqooq ul Ibad (Duties to humans and all of Allah's creation). 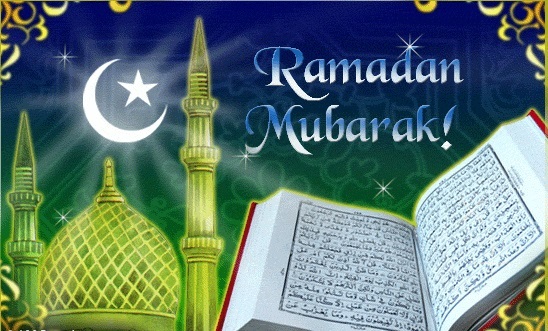 And Ramadan is an ideal time for the imams (prayer leaders) and khatibs (preachers) and popular televangelists to give equal time to both in their sermons, TV shows and speeches to the faithful attending the mosques or watching TV. The Muslim preachers must take this opportunity to tell the worshipers that Allah will not forgive any wrongs done by them to their fellow human beings; such wrongs can only be forgiven by those who are wronged. The Prophet I know brought the Holy Quran to humanity, the Book that repeatedly and emphatically challenges readers to "Think" (Afala Taqelon) and "Ponder" (Afala Tatafakkron) for themselves. This is the best proof that Islam wants Muslims to reconcile faith and reason. It was this teaching that brought greatness to Muslims in seventh through thirteenth centuries following the death of Prophet Muhammad. In this terror-stricken world, it is more important than ever for Muslims to make a serious effort to understand what Prophet Muhammad (PBUH) stood for and how he lived his life. The issues of education, faith, reason and compassion need to be understood in the light of the Quran, the Sunnah and the Hadith. It is this understanding that will help guide the Ummah out of the deep crisis it finds itself in. I urge the Muslim imams and the Islamic scholars everywhere not to waste the opportunity to educate Muslims about the life of Prophet Muhammad (PBUH) and the high importance of Huqooq-ul-Ibad in Ramadan to contribute to ending the long nightmare Pakistanis and others are are being subjected to. I spent a lot of time, more than 3 minutes for sure, to find faults in this article and as is usual, send a blasting email. But I couldn't find anything wrong. I guess that is one way of showing appreciation for an article written well. Finally something which we can agree upon! While you are agreeing with the post, I am being bombarded with unprintable comments. It appears from the tone and content that these venom-filled comments are not coming from the usual Taliban sympathizers among Muslim extremists; these appear to be the handiwork of the "Internet Hindus" (as described by Indian journalist Sagarika Ghose) and their Islamophobic allies spouting their oft-repeated anti-Islam rhetoric. It seems that these hateful posters strongly agree with the Taliban's extreme interpretation of Islam. Beautiful Article. One of the best I have read in recent times. A very well-written article. No need to share hateful and venom-filled comments. The Qur'an is an amazing book and it can be studied at different levels from just studying the literal (or superficial) meanings of the words from a translation to an in-depth multidisciplinary study of a single ayah for many decades. If only more people could discuss and understand religion with such calm and composure, the religion would be so much more accessible, acceptable and understandable. thanks for a good effort. We need writers like you to educate non muslims by sharing these thoughts in form of letters to editors to all major newspapers - same strategy followed by some of Indians and Israelis but tell the truth instead of twisting the truth like they do.